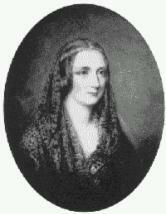 Mary Shelley was a prominent writer of the Romantic Era. Her mother was Mary Wollstonecraft, an influential feminist writer, her father, philosopher and novelist William Godwin, and her husband, the poet Percy Bysshe Shelley. From an early age she was considered special, and spent her formative years surrounded by poets and philosophers. When she was sixteen, she ran away to live with Percy Shelley, an unhappily married man. Though shunned by society, this union inspired her to write her most famous work, FRANKENSTEIN, a masterpiece of Gothic literature. She conceived the novel at the age of nineteen, while staying with Byron, Shelley and several of their friends in Switzerland, and overwhelmed by a series of tragedies in her life. When Mary Shelley was twenty-four, her husband (they had married after Shelley’s wife committed suicide) died, leaving her alone with a small son. She moved back to England, where she was despised and lived in poverty, working as a writer to support herself. Mary Shelley died of a brain tumor in 1851 – that same year the Great Exhibition, a showcase of the same technological knowledge she had warned against in her novel, was opened. Dr. Victor Frankenstein makes a creature, only to abandon his creation when he realizes his folly. The creature walks the earth, his hatred of Victor growing and scorned by all he encounters. A series of events ensures the destruction of happiness for Victor, his family, and the creature.